I found this passage quite interesting, and maybe you will too. One word in particular caught my attention: only. 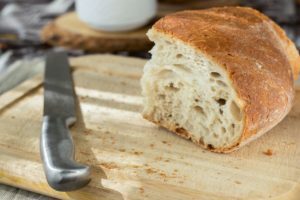 “Give me only my daily bread.” I imagine none of us have ever prayed this prayer! Who in their right mind would ask to live paycheck to paycheck? Who wants to live without the stability of a retirement fund or life insurance? Apparently we should. So why does the author say this? Couldn’t more be done for the Kingdom with lots of money rather than only enough to survive? In actuality, more can be done with only enough to survive than all the money in the world. Why? Because when we have much we no longer “need” God. We have enough to survive on our own, so we eventually forget about our God and the mission He gave us. It’s amazing how easily we forget! This is the very reason why those who have been to third world countries will say that the faith of the people there is so much more real and intensified, because they have nothing else but God to depend on. Giving up on our prayer for riches is hard though. It means giving up control. Praying for God to give you only your daily bread is difficult, because it means trusting Him over yourself. Naturally, our logical mind says that more money means more control which means more security. God says to trust Him. That can mean a lot of scary things. For one, it means that we must willingly give up our safety net and trust that God will catch us. Not having money for retirement is scary, and so is not having enough money for next month’s rent, but that only makes us more dependent on God. At that point we have no choice but to trust Him because, like the Christians in impoverished countries, we have no other choice. There’s nothing else to depend on but Him. The crutches are gone, and with that comes the ability to run. Sure, you have nothing visible to support you now, but you are free! Sure, not knowing what will happen tomorrow isn’t comforting, but it’s exciting! You never know where God will take you if you leave the choice to Him. I understand this passage well, and have even prayed it in its entirety. And then in the next breath I complain when it’s granted. “Oh ye of little Faith”. “Lord I believe. Help my Unbelief”.